While Seagate already has 8 TB models, Toshiba’s just announced 6 TB hard drives also stand out in a market that has been offering a great price per GB rate in order to compete with cheap SDDs. This HDD MG04 arrived with 2, 4, 5 and 6 TeraByte’s capacity and will be focused on the business sector, with models with a 12 Gbps SAS interfaces and some others with a 6 Gbps SATA III interface. All of them of 3.5 inches. They have been designed for work stations, servers and storage systems. They integrate a PWC persistent write cache technology to avoid data loss in case of a power outage. They have a maximum power consumption mode of 11.3 W and a 6 W IDLE. They are able to withstand temperatures of -40 to 70º C in idle and 5 to 55º C in operation. Their transfer sequential speed reach 205 MiB/s in the more powerful versions and 175 MiB/s with the smaller ones. [Update] The Communications spokesman of Toshiba Spain assured us that the firm has not abandoned (at least for now) the consumer market, but it will focus more on their professional business. However, all announced products will be launched in the schedules dates, including the Chromebooks. Following Sony’s announcement a few months ago, Toshiba has become the new computer giant, leaving the domestic PC market in the background and it will focus instead on the business and corporate world, in the search of better margins and profitability. This decision is part of an ambitious restructuring plan that involves cuts of over $180 million in costs. The 4K resolution is here to stay and it is slowly replacing the 1080p (Full HD) resolution. The newest laptop from Toshiba, the Satellite P55t, offers a 3840 x 2160 resolution in its 15.6-inch IPS panel to get a screen density of more than 280 dots per inch (dpi). 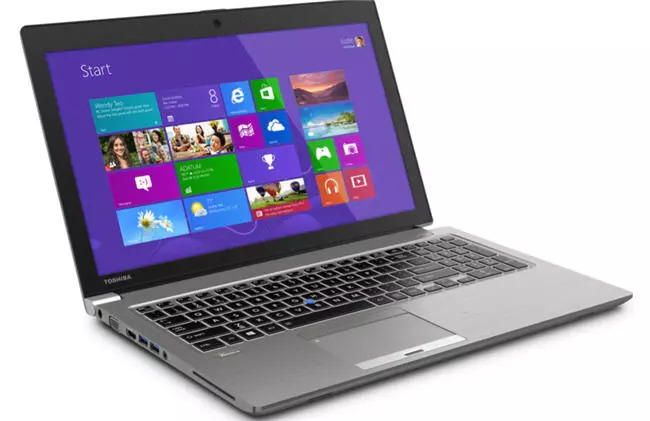 This laptop features a 4th generation quad-core Intel Core (Haswell) processor with 16 GB of RAM. The graphics card is a Radeon R9 M265X with 2GB GDDR5 of dedicated memory. It also has a 1TB HDD. Toshiba has released three new professional laptops, the Toshiba Portégé Z30, Tecra Z40 and Tecra Z50, the three of them feature Haswell Intel processors and have been vastly improved, both design and performance-wise. The Tecra Z40 and Tecra Z50 feature Intel Core i5 or i7, up to 16 GB of RAM and traditional mechanical disks of up to 750 GB or SSD drives of up to 512 GB. You can also add a dedicated NVDIA GeForce 730M graphics card. The 14-inch Tecra Z40 has a 1.920 × 1.080 resolution, while the 13.3-inch Z30 and the 15.6-inch Z50 only 1.366×768. Despite the pictures everyone has seen show them with Windows 8, this won’t be the default OS –although there will be versions with it-, instead they all will have Windows 7 Professional preinstalled.